The PGA Tour, the leading golf entity in the US, made its first bit of noise regarding sports betting legalization in Illinois recently. Illinois is another state with pro-sports betting legislation on the docket. The NBA and MLB have extended their lobbying efforts to the state, but the PGA brings a new element into the mix. Does the PGA Tour support sports gambling? Apparently so. They released a statement expressing their support for legal and regulated sports betting in “a safe and responsible manner.” Their main interests are maintaining the integrity of their sport, providing consumer protections and helping to generate capital for local governments, operators and of course, their league. Sound familiar? This is the same narrative pitched by the NBA and MLB in their quest for integrity fees and so on. When testifying before the Illinois Senate, NBA Assistant General Counsel Dan Spillane made sure to bring the presence of a PGA Tour official to the attention of the lawmakers. The PGA Tour has been relatively quiet up until this point and has yet to formally attach themselves to the NBA and MLB’s efforts. PGA Tour Commissioner Jay Monahan expressed his feelings towards sports betting in the past. He stated he has an open mind on the matter. Interestingly enough, the PGA Tour has an integrity program in conjunction with Genius Sports, a sports data company. Also, the Tour will be hosting a tournament in a West Virginia venue that could have legal wagering available due to their recently passed legislation. It is difficult to speak for the PGA Tour regarding where their true interests and thoughts lie. However, it is possible to gauge where they may stand on certain issues. The PGA Tour is likely behind the idea of getting paid through an integrity fee program. All the sports leagues will probably get on this train eventually. It is also easy to assume they will support the notion that sports betting data should be obtained via league-approved sources as opposed to third-party sites. Some states included a right in their legislation for the NBA and MLB to petition certain wagering types and sporting events; the PGA Tour will also want this ability relevant to golf betting lines. Illinois has a lot to weigh in their legislative session. There are 5 bills with some type of sports betting currently circulating, one of which appeases the NBA and MLB. Lobbying representatives traveled to Las Vegas to conduct their own research into legal sports betting in hopes of examining how to bring it to the state. 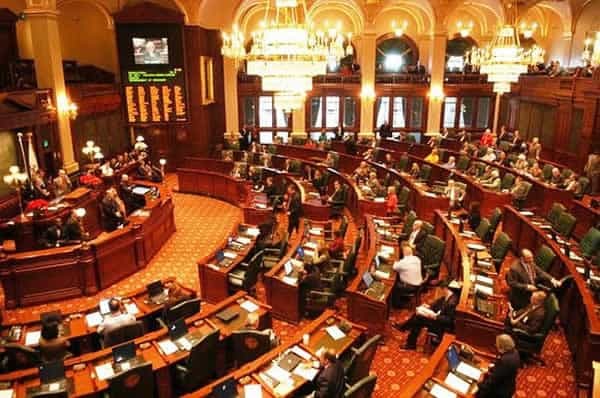 Illinois’ sports betting bill will more than likely replicate that of Kansas in compromising with sports leagues on certain aspects. For example, a .25% integrity fee (as opposed to 1%), certain data rights, etc. It is unknown how domestic legal online betting will play out given the presence of the Federal Wire Act, but some expect that law to be stricken down alongside PASPA. Keep an eye on this state in the coming weeks, as more deliberation is expected.